Cyber Cup Challenge - More than $14,000 in Scholarships and Prizes Available to Winning Teams! Please remember that you must be registered with a minimum of an Exhibit Hall pass for the Summit in order to participate in the Challenge. If you have not already done so, click on the REGISTER button located on the sidebar of this page. The Cyber Cup Challenge is back at the 2019 National Cyber Summit June 4-6 at the Von Braun Center in Huntsville, Alabama. The event aims to inspire technical skillset development through fun security-focused competitions. To view the challenge guidelines and rules, click here. 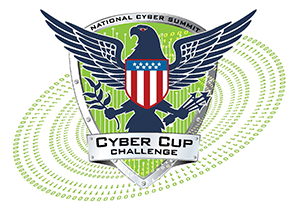 For questions related to the Cyber Cup Challenge, please contact Cary Pool at cary.pool@nationalcybersummit.com. We will have two registration categories available for the Cyber Cup Challenge at NCS2019! Free registration with the purchase of a floor pass up until June 3rd, 2019. Students are required to register with their college (.edu) or high school email address and list their school in the registration. Each student team must have 2 members but can be up to 4. All team participants must be enrolled in high school or college during the Spring 2019 semester. Team members can be from different schools or mix of college and high school student on the same team. Teams must bring their own laptops with them. Free registration with the purchase of a floor pass up until June 3rd, 2019. Professional teams can register as a corporate team or as individuals. Teams can have two members. A team of one will also be allowed to participate for those cyber super heroes! Teams will participate in one of three rounds. Each round will be four hours (8-12, 1-5 on June 5 and 8-12 on June 6). Top three teams from those rounds will win the 1st, 2nd, and 3rd place in each of the two categories (Student and Professional).You may have multiple teams from the same institution or company.